Eileen and I moved into our new apartment last month. It is a tiny two-bedroom and we are still getting settled, but it is so nice to have our own place after many months of temporary housing. A few weeks ago I had Nick over for dinner and took advantage of our glorified fire escape/porch by pulling our table and chairs out of doors. 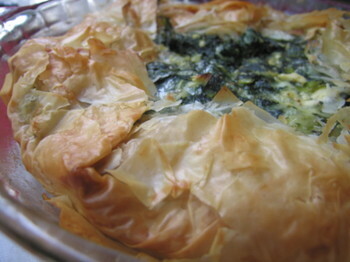 I made this spinach pie based on a recipe in the May 2006 issue of Cooking Light. 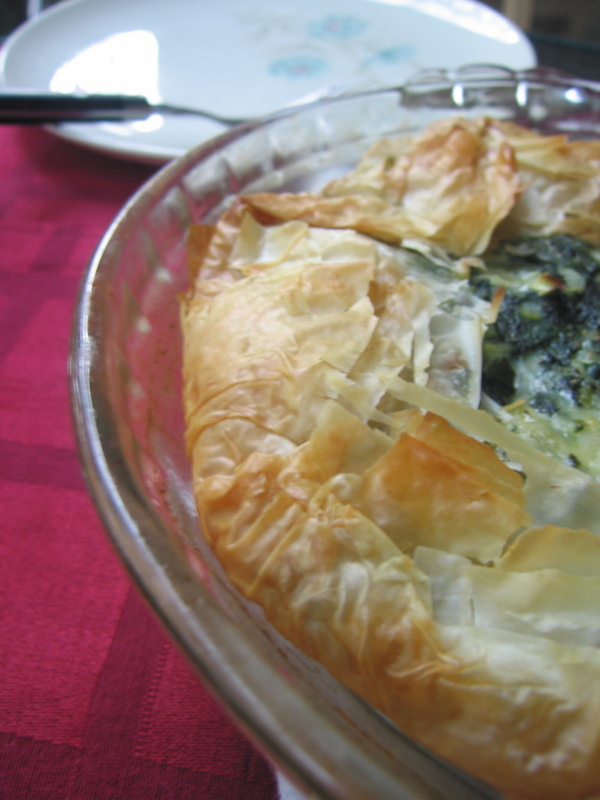 The original recipe, Spring Greens Pie, can be found on page 152. Over medium heat saute the green onions, onions and shallots in 2 Tbl butter until translucent and golden. Remove and set aside in a large bowl. Working in batches as your pan-size restricts, wilt the spinach. As each batch is wilted set aside in a colander to cool. Press out any excess moisture and transfer to the large bowl with the onion mixture before draining the next batch. Add the cheeses, dill, nutmeg, pine nuts, salt, and pepper to the onion/spinach mixture. Toss to combine evenly. 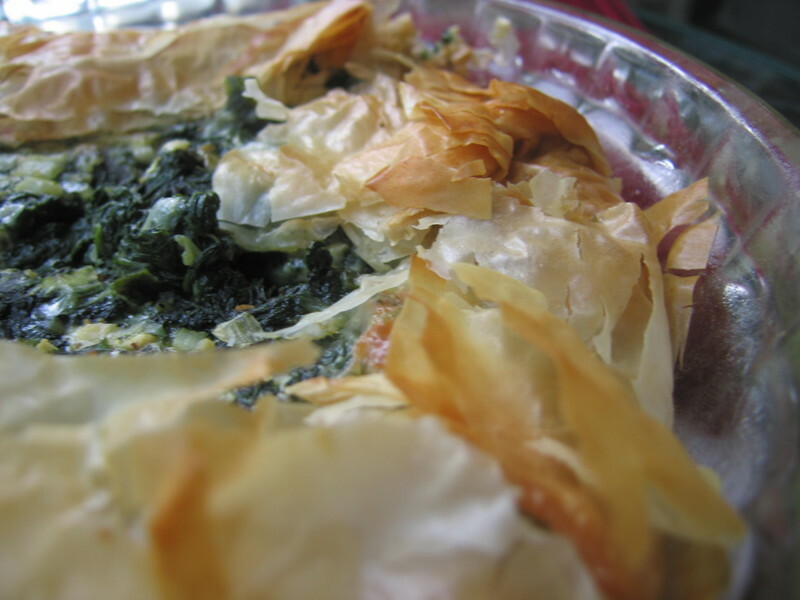 Place one sheet of phyllo dough over the surface of a buttered glass pie pan. 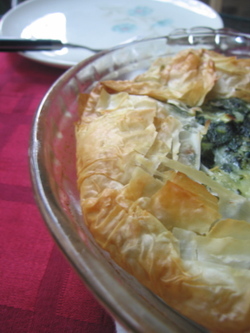 Melt 4 Tbl butter and distribute a thin coat over the phyllo dough sheet using a pastry brush. Repeat with the remaining sheets of phyllo dough, arranging the sheets in alternating directions to cover any gaps. Spoon the filling into the center of the pie dish and gently distribute evenly. Fold the phyllo dough towards the center of the pie and brush with the remaining melted butter. 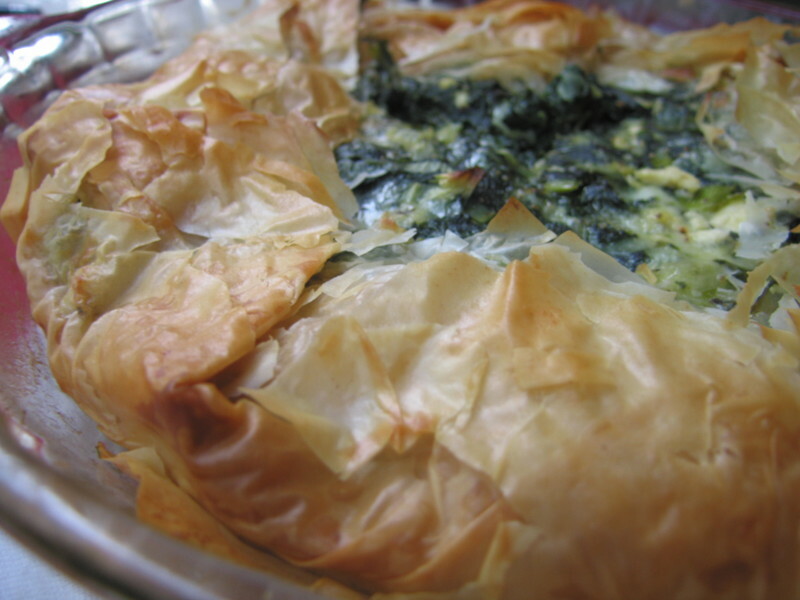 Bake for about 40 minutes or until the phyllo dough is golden brown and the center is firm to a gentle touch. Cool slightly before serving. This was a fairly hearty and basically healthy dinner pie. It was filling without sitting too heavily in the stomach for a warm summer day and went nicely with a slightly chilled red wine. Nice to see you're baking again. As the weather gets cooler we should try some new bread recipes. Indeed. I am making my tres leches cake for dinner tonight as I write this. It is a very lovely and brisk day for it. And damn was that cake good.